A key prerequisite for the successfully implementation of a knowledge-based bioeconomy and its related research is the integration of highly diverse research disciplines and the bundling of high-level scientific expertise into a single integrative approach. The RWTH Aachen, the Heinrich Heine University in Düsseldorf, the Friedrich Wilhelms University in Bonn and the Jülich Research Center already have outstanding research activities in numerous areas of bioeconomy and hence create an excellent research landscape in a strong bioeconomy-oriented industrial environment in North Rhine Westphalia. Based on a joint strategy and the involvement of existing scientific networks and collaborations, the universities and the Jülich Research Center have developed a concept with all relevant science branches represented in a unique competence center – the Bioeconomy Science Center – in NRW to provide biomass and bio-based products and processes. Teaching and training in the different theme areas of bioeconomy are core elements of the Bioeconomy Science Center. These mandates allow the Bioeconomy Science Center to make an important contribution towards interdisciplinary training of specialists that is urgently needed in all areas of knowledge-based bioeconomy. The Bioeconomy Science Center is based on an integrative structure consisting of basic research, applied and industry-oriented research including the natural, engineering and economic sciences and is focused on the mission of sustainable bioeconomy on the pillars of the science system. With this integrative structure, the Bioeconomy Science Center establishes the technological and scientific basis required for the successful implementation of a sustainable bioeconomy. The Bioeconomy Science Center bundles scientific competence, resources and innovative infrastructure as a foundation for research and technology transfer. The research realizes synergies and develops integrative approaches and joint technology platforms for the bioeconomy mission and thus seizes the opportunity to become an international innovation leader in this pioneering field. The initiative of the NGP² (Center for Next Generation Processes and Products; current project application) of the Process Engineering in Aachen at the RWTH Aachen, for example, will be integrated into the Bioeconomy Science Center in order to support the focus on the field of engineering and science basics for processing of renewable resources and to bring together the research groups of the RWTH working in this field at the BioSC in a research building applied for according to §91b in close proximity to the natural sciences at the Melaten campus. In the Bioeconomy Science Center, key areas of the federal government’s high-tech strategy and the national high-tech strategy on climate change are implemented in relation to bioeconomy. This work is done in close cooperation with the Research and Technological Council Bioeconomy, the European technology platforms and the economy in research and training. The BioSC offers a regional basis for existing national and international networks such as the Helmholtz Association and “Sustainable Bioeconomy” Portfolio, the Cluster for Industrial Biotechnology - CLiB 2021, The German Plant Genomics Program – GABI, the Microbiological Genome Research – GenoMIK, different European technology platforms, the German Plant Phenotyping Network (DPPN, under review), the Agriculture Competence Center, various collaborative research centers, research groups, post graduate programs and transregios, as well as several EU projects, industrial collaborative projects and industrial projects. The Bioeconomy Science Center bundles and expands existing outstanding competences in the bioeconomic research in NRW. Appropriate research policy support could make the Bioeconomy Science Center a flagship project with international reach. The Bioeconomy Science Center would serves as the foundation for the acquisition of public and private funding and as a focal point for other excellent national and international collaborations. Core Groups are institutes and institute sectors that primarily deal with themes of the four main research activities or interdisciplinary issues of the BioSC and belong to the partner institutions of the BioSC. Associated Groups are institutes or organizations from external non-partner institutions that make crucial contributions to the main research activities or interdisciplinary issues of the BioSC but whose profile includes focal areas that are not included in bioeconomy research. 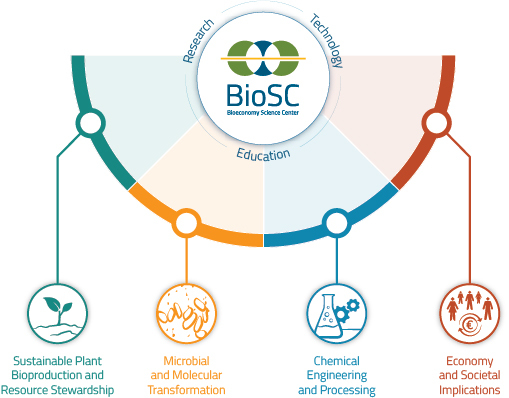 Additional important elements in the BioSC include scientific cooperation and connection projects that expand the scientific and technical competence areas of the BioSC and industry collaborations for technology transfer in applications for future markets. The most important element of the BioSC is the work in and between the participating scientific working groups. They cover the key issues in the main research fields and interdisciplinary topics of the BioSC. The institutes involved ensure high scientific quality, which is bundled in interdisciplinary projects oriented towards solving key questions of bioeconomy, in line with the BioSC strategy. Decisions regarding matters of fundamental importance for the BioSC are made at the meeting of the contractual partners. The scientific managers of the institutes (core groups) form the directorate. The directorate discusses and decides on the strategic and scientific priorities within the BioSC (e.g. voting in appointments) in coordination with the strategic and scientific guidelines of the institutes involved and in agreement with the contractual partners. The BioSC office is under the control of the executive board, which supports the office in its tasks and objectives and centrally guides the BioSC. In addition, an advisory board consisting of national and international figures from science, economy and other fields of society is appointed; this board advises the directorate and the contractual partners in overall strategic issues of development.